Can anyone help me. I'm trying to monitor a Dell Compellent. I have downloaded the mib, created the oid and also run a snmp walk to the device. I can't get anything near meaning full from the device. Which oid's do I use? Do I need a seperate sensore per oid? I imported the whole of the oid file into PRTG, which slows down the web interface. This allowed me to finish the process but all I got back was response times to volume names etc. While we have some built-in sensors that may work with Dell's Storages, you might be looking for additional metrics/sensors. We've put together a couple of lookups and a device template, which can be used to automate the deployment of these sensors using auto-discovery. The device template creates the available and compatible sensors based on the data at hand. The sensors implement default alerts whenever possible, but you can still fine-tune most channels by defining additional limits in the sensor channels settings or modifying the lookups included with the template. SNMP must be enabled on the device and the device must support the DELL-STORAGE-SC-MIB from where the data comes from. Depending on the amount of Logical Disks configured on your Storage you may see a very large number of sensors (one per Logical Disk). It is recommended to increase the scanning interval to at least 5 minutes in this case to avoid excessive SNMP queries. The temperature sensors may cause issues in some Firmware/Software versions. Feel free to follow-up if you encounter unexpected errors so that we may investigate. You may get a "Storage Folder: Unassigned" sensor throwing errors by default: "0 GByte (Free Space) is below the error limit of 10 GByte in Free Space" - This sensor can be paused/deleted. Some of the sensors (where a number like (1) or (1.1) is present in the name) are index-based, this means that if the device reboots or is updated the indexes *may* change. If this happens the sensors may become unreliable. If device is updated or rebooted it's advisable to delete these sensors and re-run the auto-discovery afterwards to be safe. The sensors will then be re-created and use the correct/appropriate index. PRTG shows some of the alerts as reported by the monitored device via SNMP using Lookups. If the status is not reported correctly via SNMP, PRTG cannot detect any issues. For additional alerts, please set up limits for additional channels. Download the required zip archive containing the template's files here. Extract the archive to your PRTG program directory. By default, this is %ProgramFiles(x86)%\PRTG Network Monitor\. Right-click your new device, select Run Auto Discovery with Template, browse for Dell Storage and select the Custom Dell Storage v0.x template from the list. 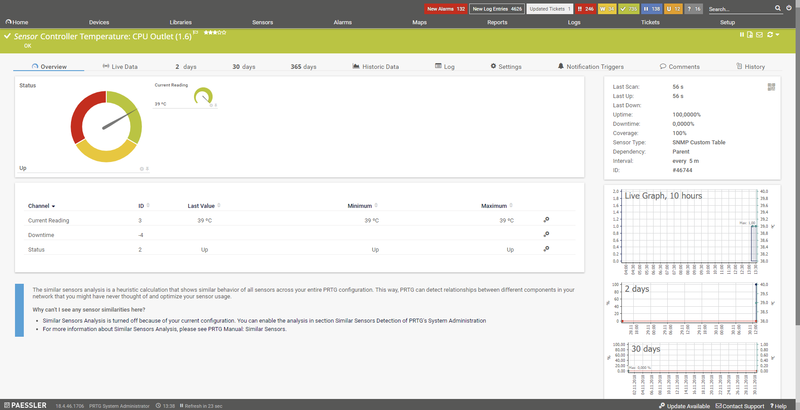 In the example above, some sensors were skipped because the device did not respond to the snmp_scCacheTable check. This means that this data is probably not available on your device. You can track this data by looking for the name after snmp_. In this case, a search for scCacheTable will tell you what OID from what MIB is missing. 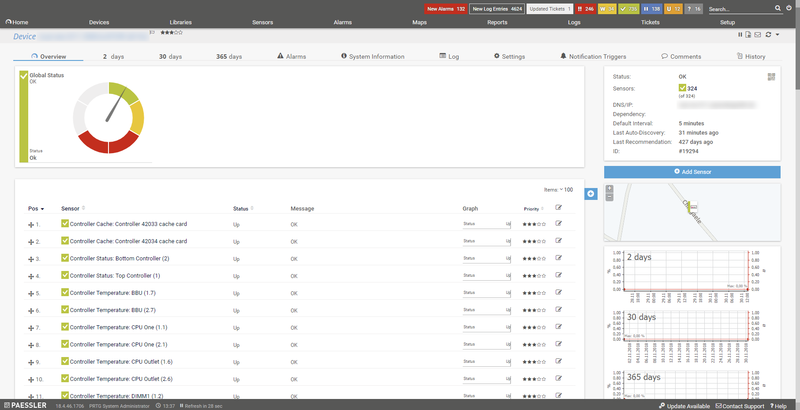 If the discovery log is not sufficient, you can review the SNMP data directly from your device. To do so, download this file and use it with the Scan Script option in our SNMP Tester. 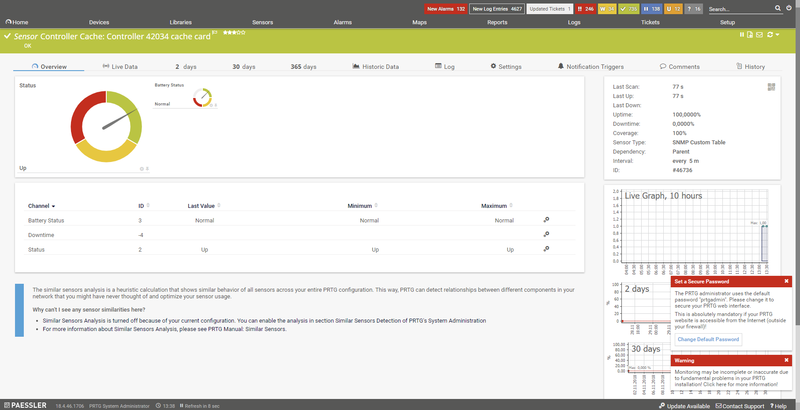 This will allow you to review which SNMP queries succeed and which do not deliver any data. Please have this information at hand when contacting our support team. Please use our SNMP Tester (http://www.paessler.com/tools/snmptester), run it on the PRTG Host (or host of the Remote Probe), and perform a "Scan OIDlib" with your OIDlib against the target device. Please send us the result logfile from the Tester and the used OIDlib via mail by support@paessler.com. Please put "PAE979509" in the subject line. Hi there, i've got the same Problem. The SNMP Tester ist running at the Moment. Can i send you the Mail to support@paessler.com to? do you have a solution to monitor dell compellent like volume free size? This might be possible. Please contact us via E-mail or via a support bundle in reference to case PAE1032632 and we can have a look at the available SNMP Data. This may allow us to put together a template for free size, but we'll need to compare the SNMP Data to the values on your devices's management interface to make sure that they are correct. We'll provide instructions on how to obtain this data after you contact-us via Mail or Support Bundle. We haven't heard back from janine_sald, but feel free to follow-up via E-mail refering to case PAE1039693 and we'll be happy to assist you further.